The armband featuring a strong fabric trim, which can prevent the armband torn apart during vigorous exercises. Adjustable velcro band supports a wide range of arm girth from 8.3" (21cm) to 15.7" (40cm). The extension band reach to 5 inch(12.7cm). Headphone and charger cutouts allow direct access to the phone through the armband.Hidden jack design, without sacrificing perfect outlook. Built-in Key holder and Card Slot which allows for safe storage of ID, credit card and cash. Excellent Material: Choosed breathable neoprene material, it provides soft, odor-free, stretchable and lightweight comfort wearing experience. With a HD transparent PVC front cover, it has a high screen sensitivity, easily touch screen function. Practical Additional Function: The armband is printed a reflective strip to keep visible in low light conditions. Very intimate designs, printed "+", "-" volume button, built-in key pocket, card pocket. In addition, the material is sweatproof, water resistant and washable. Unique Structure Design: The armband features a durable fabric over-edging in all selvage, to prevent tearing apart during strenuous exercise. Special velcro strip stops your earphone cable getting tangled. Large Adjustable Range: A combination A/B slots gives it a large size range. It easily fits arm girth from 8.3" (21cm) to 15.7" (40cm). The extension band reach to 6.3 inch(16cm). 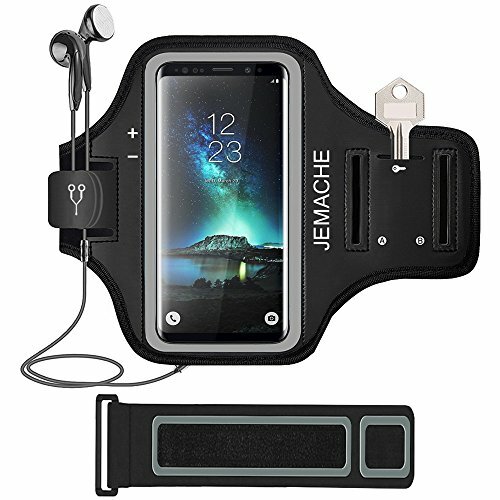 Universal Size: This armband is perfect fit for Galaxy S8/S9 Plus (6.2") Galaxy Note 8(6.3"), and compatible with Galaxy S5/S6 Edge+/J7, Note 4/5. It is big enough to fit OtterBox DEFENDER / SYMMETRY, Spigen, Lifeproof Case.